German orchestral black death metallers Obsidian Gate return after a decade of silence! The band has announced the release of its 3rd full-length album “Whom the Fire Obeys“, 11 years after their self-released EP “The Vengeance“. Forged by the band itself, the album contains 11 tracks of a fast and crushing hybrid between death and black metal with omnipresent orchestral maneuvers. 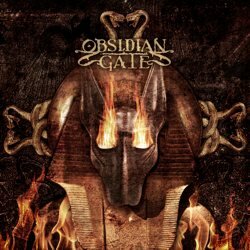 The album is going to be released both as digital download as well as on a limited to 500 copies digipak edition by Kristallblut Records, and marks a new beginning in the history of Obsidian Gate. “Whom the Fire Obeys” is expected on December 2013 / January 2014 and the band has already revealed the cover artwork and album tracklist.